February 6, 2108 marks the centennial anniversary of (limited) women’s suffrage in the UK. As numerous cultural and media organisations mark the anniversary, here are some current and upcoming projects that focus particularly on “suffrajitsu” – the use of jiujitsu by radical suffagette Bodyguards, circa 1913-14. Chicago’s Babes With Blades Theatre Company is currently staging Anne Bertram’s play The Good Fight, which details the history and missions of the suffragette Bodyguard team. Women’s jiujitsu pioneer and Bodyguard trainer Edith Garrud appears as a character in the play. England’s Horse + Bamboo Theatre Company is currently developing Suffrajitsu, an original play celebrating the suffragette Bodyguard through puppetry, music and film. Aimed at young audiences, the play will begin touring the UK in Autumn 2018; you can learn more about it, and support the project via this Crowdfunder site. The UK fashion and lifestyle magazine Stylist has featured suffrajitsu, including some great original illustrations, in its suffragette centennial issue. Currently in production, the documentary No Man Shall Protect Us: The Hidden History of the Suffragette Bodyguards will make use of narration, rare archival media and dramatic re-enactments. Successfully crowdfunded in late 2017 and co-produced by Tony Wolf, author of the Suffrajitsu graphic novel trilogy, the completed documentary will be made freely available online later this year. The Royal Armouries Museum in Leeds, England will be showcasing Edith Garrud’s suffrajitsu as part of the Warrior Women exhibition during mid-late February. The Museum of London’s year-long Votes for Women exhibition includes a showcase for Katherine “Kitty” Marshall, who was an active member of Emmeline Pankhurst’s Bodyguard team. Marshall also wrote the memoir Suffragette Escapes and Adventures, which currently exists in manuscript form as part of the Museum’s suffragette collection. Author Emelyne Godfrey’s book on Kitty Marshall and the Bodyguard will be released later in 2018. Click here to contact the organisers and/or to book your place for this fascinating lecture on the real secret society of suffragette bodyguards who inspired the Suffrajitsu trilogy! What’s it about? The lecture will explore the blossoming of martial arts in Great Britain at the turn of the 20th century, investigating the Victorian obsession for self-defence, the appeal of the ‘exotic East’, and gender as a social and cultural construct. Starting with the mid-Victorian garotting panics, Dr Godfrey will show how a fear of violent street crime was entangled with a fascination with Indian thuggee and how in response, civilians manufactured gruesome weapons. By the end of the 19th century, the use of violent forms of self-defence had become unfashionable and Japanese martial arts were considered to be the ideal, minimally aggressive way to fend off attackers. Experts from Japan taught politicians, the public and police alike the art of jujitsu and women sensationally took up jujitsu in the campaign for women’s suffrage. A century later, martial arts with an Edwardian twist are again in vogue. 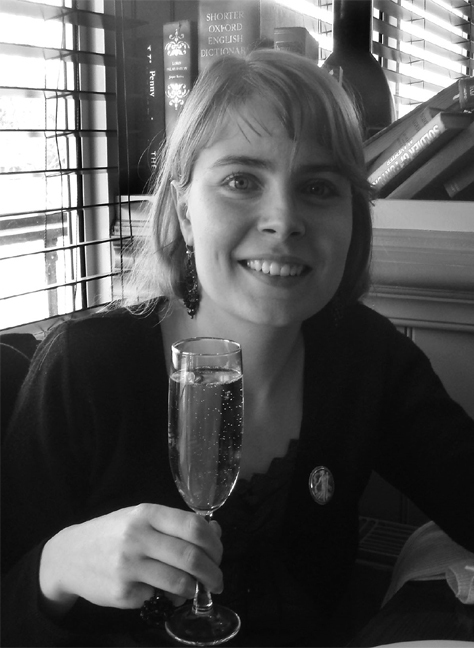 Dr Godfrey is a writer and researcher specialising in the Victorian and Edwardian eras. She is a regular contributor to the Times Literary Supplement and has been interviewed by the BBC on numerous occasions. Author of Masculinity, Crime and Self-Defence in Victorian Literature (2010), and Femininity, Crime and Self-Defence in Victorian Literature and Society (2012), her latest work Utopias and Dystopias in the Fiction of H.G. Wells and William Morris will be available in September 2016. 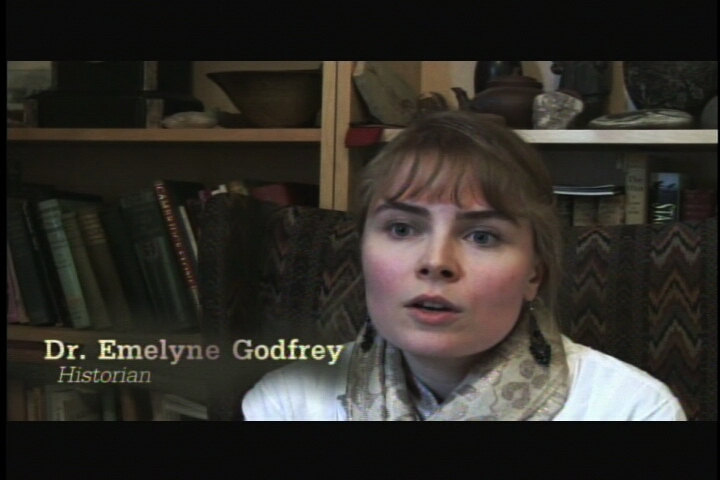 Dr Godfrey is currently working on a book on the suffragettes. A mini-documentary on Edith Garrud, who trained the Amazon bodyguards of the radical suffragette movement circa 1914. 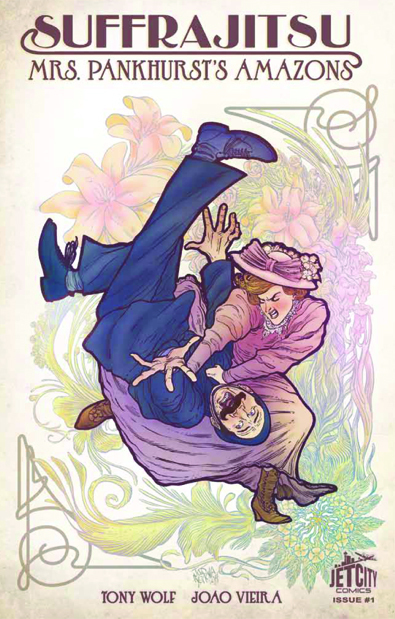 From Jujitsu Suffragettes, by Emelyne Godfrey, BBC History Magazine Nov. 2012. Kitty Marshall as visualised by artist Yasmin Liang. The stories of the Suffragette Amazons were all but forgotten throughout most of the 20th century, but the Women’s Liberation movement of the 1960s and ’70s sparked a revival of interest in their “secret history”. Notable amongst these were Antonia Raeburn’s The Militant Suffragettes (1973), the BBC TV mini-series Shoulder to Shoulder (1974) and Midge Mackenzie’s companion volume Shoulder to Shoulder: The Stirring History of the Militant Suffragettes (1975). The advent of the Internet has seen an increasing number of Suffragette Amazon-related media projects, from books and websites to documentaries and graphic novels. Writer/director Noel Burch directs The Year of the Bodyguard, a docudrama for Britain’s Channel 4 that deals with the social history and lore of Mrs. Pankhurst’s Amazons. Unfortunately, it has never been released on DVD and modern screenings are extremely rare. We are, however, pleased to be able to present this interview with Mr. Burch in which he reminisces about the production, together with this detailed, illustrated summary of the docudrama itself. Gretchen Wilson’s With All Her Might (1998) is a biography of her great-aunt, Gertrude Harding, who was one of the principal organisers of the Suffragette Bodyguard society. 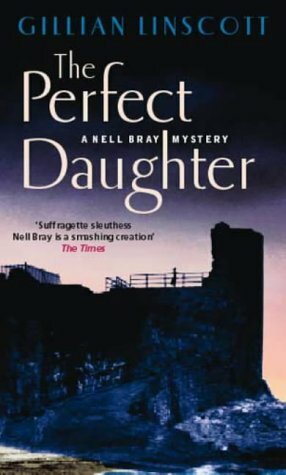 The Perfect Daughter, part of Gillian Linscott’s series of novels about Suffragette detective Nell Bray, features a martial arts-oriented subplot and Edith Garrud appears as a supporting character. Both volumes of the Bartitsu Compendium (2005/08), edited by Tony Wolf, feature collections of archival newspaper articles relating to Edith Garrud and the Bodyguard team’s martial arts training. 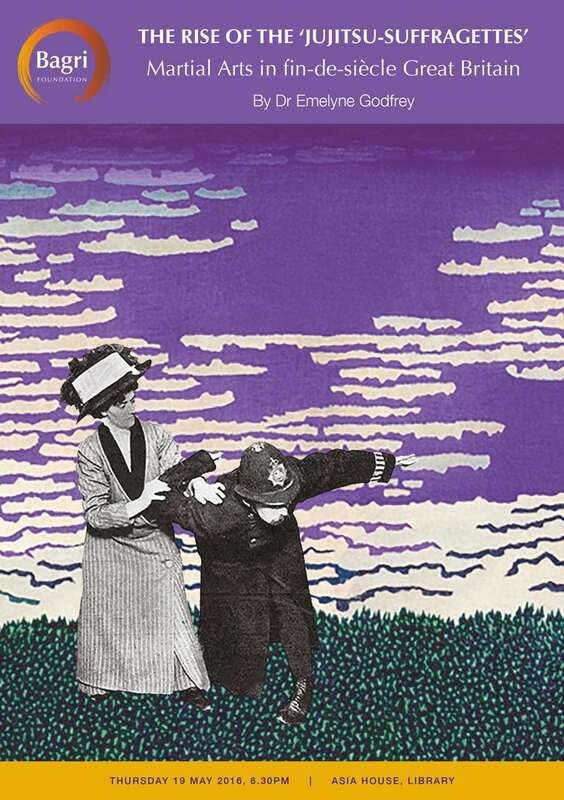 The Lady Cavaliers theatre company produces a short play, Mrs. Garrud’s Dojo, that offers a lighthearted look at early 20th century gender politics via “Suffrajitsu”. Tony and Kathrynne Wolf publish Edith Garrud – the Suffragette who knew Jujutsu to introduce the story of the Amazons to younger readers. The documentary Bartitsu: The Lost Martial Art of Sherlock Holmes, co-produced and co-directed by Tony Wolf and featuring an interview with Emelyne Godfrey showcases the Jujitsuffragettes and features a re-enactment of their combat training. The play The Hooligan and the Lady, a dramatised biography of feminist jiujitsu pioneer Florence “Flossie” Le Mar, was a hit at the 2011 New Zealand Fringe Festival. 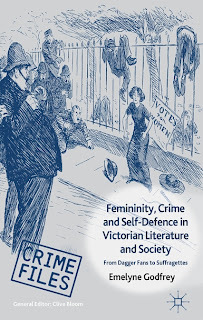 Emelyne Godfrey’s book Femininity, Crime and Self-Defence in Victorian Literature and Society: From Dagger-Fans to Suffragettes devotes a full chapter to the Bodyguard, Edith Garrud and Edwardian jiujitsu. Anne Bertram’s play The Good Fight, performed by Theatre Unbound, explores the social and political pressures that led the WSPU to create the Bodyguard team. Click here to listen to reporter Julian Bedford’s interview with Tony Wolf for the BBC World Service radio programme, concerning the Suffragette Bodyguards. The BBC documentary Everybody Was Kung-fu Fighting: A History of the Martial Arts in Great Britain (2013) showcases the Suffragette Amazons, featuring an excerpt from The Year of the Bodyguard and interviews with Emelyne Godfrey and Tony Wolf. Icon Films produces this mini-documentary on the life and times of jujitsuffragette trainer Edith Garrud, hosted by Honor Blackman and featuring an interview with Emelyne Godfrey. The graphic novel Suffrajitsu, written by Tony Wolf with art by João Vieira, is published via Amazon’s Jet City Comics imprint. The mystery novel Move your Blooming Corpse, featuring Eliza Doolittle and Professor Henry Higgins as detectives in Edwardian London, also includes Edith Garrud and the suffragette Bodyguard team. Emelyne Godfrey is the author of Masculinity, Crime and Self-Defence in Victorian Literature and its sister volume, Femininity, Crime and Self-Defence in Victorian Literature and Society. Q – Emy, can you describe how the new book fits in to your ongoing research on the topic of self defence during the “long Victorian era”? A – It was effectively the third chapter of my PhD on Victorians and self-defence (which focused on H. G. Wells’ Ann Veronica and women’s self-defence and martial arts in Edwardian literature) but as I started researching for this book, I found so much new material so it felt as if I was starting the research from scratch. Writing it took somewhat longer than expected! Q – What were your motivations for writing on this topic? In particular, how did the new book come about? A – The books were ultimately the result of my mother’s suggestion a number of years ago that I go on a self-defence course which she had seen advertised on TV. At the time, I was a student at Birkbeck College, London, doing the MA in Victorian Studies and was casting about in my mind for a topic for a PhD and was reading about the Ripper murders when it occurred to me to ask how men and women defended themselves during this time. Alongside that, I learned from speaking to women after the self-defence course was that concepts of safety as they relate to feminism were so subjective. Q – In what way? A – Our self-defence instructor told us she refused to go out on her own after 8pm, which some women said didn’t sound very empowering, or feasible, especially if you were a student at Birkbeck, when some classes ended at 9pm. What was empowering? Avoiding danger or staying out a bit later and taking the last bus home? Other questions also popped up: how did one respond to being accosted or threatened, where were the sources of danger, and did men and women assess threat in different ways. I started interviewing anybody I saw about the subject of safety and I was passionate about seeking the answers. Intriguingly, men and women were debating these questions in the Victorian era, a time which saw a massive growth in London’s population and also witnessed the growing numbers of independent women of all backgrounds engaged in all kinds of work, and also philanthropy, travel and political campaigning. Q – The subtitle refers to “Dagger-Fans and Suffragettes” – can you tell us what a “Dagger-Fan” is? A – The dagger-fan was a novelty hand fan, designed in the shape of a dagger in its sheath. It’s kept at The Fan Museum in Greenwich, which displays some gorgeous fans from throughout the ages. At least one contemporary commentator observed with humour that such a dangerously shaped accessory might subtly discourage unwanted admirers who might lurk on trains or at street corner. The dagger-fan is symbolic of all the many kinds of subtle means, discussed in this book, that a woman could employ to deflect threat while out and about – gesturing with her fan, a humorous retort, disguise, a clever use of eye contact. As Anne Brontë’s The Tenant of Wildfell Hall and Mona Caird’s The Wing of Azrael, remind us, the ‘marriage market’ and the Victorian home could be a place of danger where all kinds of self-defence skills were needed. What I think all the writers examined in this book show is that there were some areas of life where the law couldn’t reach, and women had to be able to learn to protect themselves. Q – Of all the heroines described in your book, who is your favorite, and why? A – I admire the character of Judith Lee as she’s an independent spirit, and she can defend herself using jujitsu against a variety of criminals. I also think that the way an author writes about danger is as important as characterisation. While Judith Lee gets very angry, she has an understated, almost stiff-upper-lip way of talking about peril, which is quite amusing, a credit to the skills of her creator, Richard Marsh, was actually an intriguing figure himself. A – He was involved in amateur dramatics before his writing career began, he also had a gift for portraying the mindsets and distinctive voices of his characters. He was author of the horror-thriller, The Beetle: A Mystery, which was published in 1897, the year in which Dracula appeared, and, according to a number of scholars, was more popular than Bram Stoker’s novel for some decades. Marsh also spent some time in jail, changed his name and became a prolific writer. What interests me about Marsh was that he combined horror and violence with humour in his stories. His work daringly referenced contemporary crimes such as the Whitechapel Murders – you can see shades of that in his Judith Lee story, Conscience. He really struck a chord with the public with his depiction of Judith Lee, who was in many ways Sherlock Holmes’s equivalent. Q – You’re also the publicity officer for the H.G. Wells Society. How does Wells’ character Ann Veronica fit in with your theme? A – I must say that don’t agree with all of Wells’s views on, for example, women, and some of his views are quite controversial today (he was in many ways a man of his time as well as being a forward thinker) but I think he’s a wonderful novelist and wordsmith whose work is both stirring, lightly humorous and cheekily iconoclastic. I do love his depiction of Ann Veronica, his Edwardian heroine, who wants to see life. A keen hockey player, she also learns jujitsu at high school and uses her knowledge of martial arts to defeat the rather sleazy Mr Ramage, who tries to take advantage of her in a locked hotel room. I think Wells sensitively portrays her feelings of guilt at having tackled him quite so effectively, but at least she does defend herself and doesn’t rely on a hero to come along and save her. I see Judith Lee and Ann Veronica as early equivalents of feisty women in today’s literature and culture, particularly Buffy Summers from the Buffy the Vampire Slayer television series, Katniss Everdeen from The Hunger Games and even Anastasia Steele from Fifty Shades of Grey – they aren’t invulnerable, they suffer setbacks, deal with the ups and downs of love but they each have their own particular powers and channel their anger into the hand-to-hand defence of good causes. Q – Finally, Emy, your book includes a chapter on Edith Garrud and the martial arts training of the Suffragettes. The image of the jujitsuffragettes is easily romanticised by modern readers. What would you say was the actual, and/or symbolic, social significance of Suffragettes training in the martial arts circa 1913? A – I’m still making up my mind on that subject. On the one hand, I do agree that there is a tendency to romanticise jujitsuffragettes today, probably because the idea of a woman wearing a corset, big hair and an even bigger hat fighting a man and felling him to the floor cuts a bit of an incongruous yet charming and quaint image in the modern mind. I think some campaigners enjoyed the limelight too and, as H.G. Wells, suggests in Ann Veronica, some may have joined the movement to do something exciting. Some of them also espoused some more violent means which were controversial. On the other hand, when you read what some militants went through in jail – sleep, hunger and thirst striking – and how they fought against the ignominy of force feeding (and the Bodyguard bravely protected their leaders from re-arrest and torture under the Cat and Mouse Act) you really get a sense of how brave these women were. I think that whether or not the vote was won by women’s war effort, the suffragettes, and indeed suffragists, raised the public consciousness with regard to female suffrage; it’s something I always think about when I put my cross on the ballot paper.